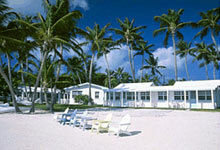 We list and link EVERY lodging provider in Islamorada & Plantation Key that we know of. Like this page ?? 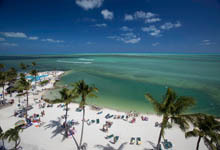 If so, visit Keysdirectory.Com for even more detailed information about Islamorada & Plantation Key. We have picturesque rooms and several charming efficencies overlooking the oceans sunrises and sunsets, as well as our fleet of 44 fishing boats--a glorious sight! As you might expect, we have a colorful group of fishing buddies who can regale you with tales of glory and how big it really was! A timeshare resort offering efficiencies and 1-BR suites on a 10-acre tract with a heated swimming pool, 40-slip full-service marina, restaurant and lounge, and a white sandy beach. Go for the weekly rates, their single-day rates are high. Towering coconut palms. Natural white-sand beach. Luxurious Caribbean homes and villas nestled on 8½ acres at the oceans edge. Hot spa and swimming pool with cascading waterfalls. Freshwater beach-entry pool. All this plus our own marina with deep-water channel and two fishing piers over 450 feet long. Hidden away in a secluded quiet tropical atomosphere in the Florida Keys. It beautifully decorated in a very unique and different style! Cheeca Lodge & Spa is located on the beach in Islamorada, close to Hurricane Monument, History of Diving Museum, and Bud n' Mary's Dive Center. 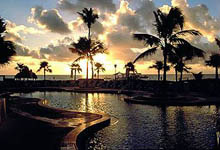 Theater of the Sea on Islamorada is also a point of interest near this luxury resort. This Islamorada property has a private beach. Dining options at Cheeca Lodge & Spa include 3 restaurants. A bar/lounge is open for drinks. Room service is available 24 hours a day. Recreational amenities include an outdoor pool, a health club, a spa tub, a sauna, and a fitness facility. The property's full-service health spa has massage/treatment rooms. This 4.5-star property has a business center and offers small meeting rooms, limo/town car service, and audio-visual equipment. High-speed Internet access is available in public areas. This Islamorada property has event space consisting of banquet facilities, conference/meeting rooms, and a ballroom. Business services, wedding services, and tour assistance are available. Designed to be your budget home in the Florida Keys. Quiet, Clean, and Comfortable Budget Accommodations. Our swimming and sunbathing area (no pool), with its chickee huts, lounges and canal affords swimmers, sunbathers and kayakers quiet pleasurable hours in the sun. A hot tub is available in our courtyard for your pleasure. Scuba, snorkeling, charter boats and back country operations nearby. The Keys....the way it used to be. Just where the Keys begin to arch toward blazing sunsets, and the din of busier islands fades to nothing, stands the tropical paradise called Lower Matecumbe and the Coral Bay Resort. Unspoiled and unhurried, the Coral Bay Resort preserves an informality and grace that other places can only distantly recall. Low prices - friendly, helpful staff! Our accommodations range from standard motel rooms with double beds to rooms with kitchenettes. All rooms have air conditioning, ceiling fans and cable television. Grills and laundry facilities are available on-site. Handicapped accessible. Historic 1950's retro style resort, on the bay. Informal, relaxing and unforgettable. A fisherman's dreams and a family's paradise. Family operated motel, enjoy the environment in which the owners strive to conserve. Take a walk on the beach and enjoy the beautiful sunsets. Rooms, 1-BR suites, 2-BR cottages & more ! 6 tropical acres with 500 feet of oceanfront ! Family owned and operated resort that offers 1,2 and 3 bedroom villas and apartments, each with a fully equipped kitchen, color television, phone, heat and air conditioning, and daily maid service. Cook your catch inside or outside at the covered tiki patio and barbecue area. large, heated, fresh water swimming pool with slide. Almost every room has a magnificent view of the water. A wide range of accommodations that include charming cottages, one and two bedroom suites, studio efficiencies and standard motel rooms, all of which were tastefully renovated in 2001. We have a heated pool and a Jacuzzi. 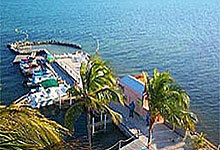 Certified as a Superior Small Lodging, we are located directly on the expansive waters of Florida Bay. Room Rates Sun-Thurs only $69 a night ! Gary Dunn, a Pittsburgh Steeler for 12 years, invites you stay in one of his 8 newly renovated rooms. Eat with the big boys in the Pub, which is open for breakfast, lunch and dinner. 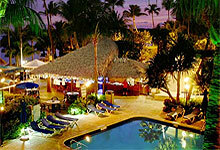 Room rates from just $69 - best seasonal rates in the Keys! Trivia: we hold the very first liquor license issued in the Florida Keys! Play tennis, sit in the jacuzzi, swim in the pool, or just relax. We offer a very extensive web site. We offer standard hotel rooms, efficiencies & ocean-front deluxe suites. Water sports are available on-premise. Dolphins, manatees and great sport fishing can be found at the Pelican. Video tour on-line! A resort in the true sense of the word - COUPON! We are situated on a six-acre tropical estate on Florida Bay. Pets welcome. Non-smoking rooms available. Large swimming pool, boat ramp & docking space available within walking distance, room for trailer parking, restaurant and lounge on-premise. Great sunset views! Comprised of 20 single family octagonal stilt homes. Each villa has 2 bedrooms, 2 baths, living room and a fully equipped kitchen, plus washer and dryer. Heated pool and spa, tennis courts, and a boat ramp. Timeshare units available to purchase. The Topsider Resort is a great place for families to stay.